The content of this article provides interesting history, facts and information about the reprieve of a Gladiator. Not all gladiator fights were fought to the death. If a combat ended in a draw or the lose fought bravely and well it was possible that a grant would be made for the reprieve of a gladiator. To fully understand the process which led to the reprieve of a Gladiator it is necessary to understand the language of the arena and the gladiators. 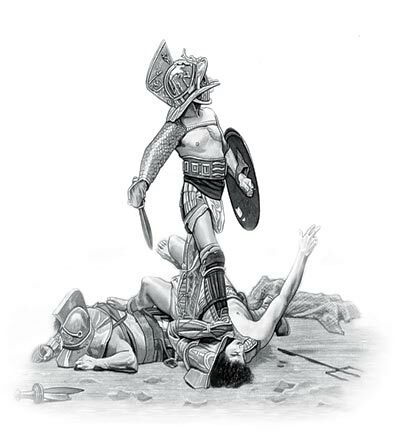 Missio: A Roman gladiator who acknowledged defeat could request the munerarius (giver or 'editor' of the games) to stop the fight with the repieve of the gladiator and send him alive (missus) from the arena. Stans missus: A gladiator who had not fallen he could be "sent away standing" (stans missus). The decision as to whether a gladiator was given a reprieve was in the hands of the spectators. Pollice verso: Pollice verso meaning "With thumb turned." This referred to the gesture given by the 'mob' as to whether the reprieve of a gladiator was in order or that they demanded his death. Although it is assumed that Pollice verso meaning "With thumb turned." meant that the thumbs down position although this could have meant that the thumb was turned to the side. This signal and their shouting indicated whether or not a gladiator should be given a reprieve - granted missio. Pugnare ad digitum: Pugnare ad digitum meaning "To fight to the finger." The situation where a gladiator submitted by raising his finger, or his hand, or whole arm) to signal the munerarius to stop the fight, hoping for a reprieve. The content of this Reprieve of a Gladiator category on life in Ancient Rome provides free educational details, facts and information for reference and research for schools, colleges and homework. Refer to the Colosseum Sitemap for a comprehensive search on interesting different categories containing the history, facts and information about Ancient Rome. Just like the subject of Reprieve of a Gladiator there is hardly a page of Roman history and the Romans that is not, on some way, connected to the Roman Colosseum which became a symbol of Rome, its society, culture and life.